Bio-Rad provides a specialized service for custom anti-idiotypic antibody generation to support the clinical development of biotherapeutic drugs. High affinity, fully human anti-drug antibodies are ideal for use in pharmacokinetic (PK) bridging ELISAs and as a reference standard in anti-drug antibody (ADA) assays. 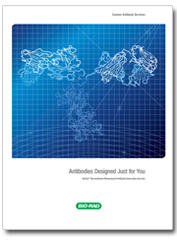 Our guided selection strategy for in vitro anti-idiotypic antibody generation involves selection of the antibody on the drug in the presence of isotype sub-class matched antibodies as blockers. This avoids enrichment of specificities that bind to other regions of the antibody drug and ensures idiotope specificity. Additionally, selection performed in the presence of human serum avoids matrix effects in the final assay. The selection method can be guided to generate anti-idiotypic antibodies with different binding modes and properties, figure 1. Inhibitory antibodies (type 1) are ideal for neutralizing assays and PK bridging ELISA. Selection of an antibody that binds to an idiotope outside the antigen binding site of the drug results in a non-inhibitory antibody that can be used to detect both free and bound drug in the sample (type 2). Unique to Bio-Rad is the capability to isolate rare specificities, such as drug-target complex binders (type 3) that can be used to quantify bound drug, as opposed to free drug levels. Fig. 1. Binding modes and properties of anti-biotherapeutic antibodies generated by Bio-Rad using HuCAL technology. Using a combination of the different types of drug-specific antibodies offers the assay developer enhanced flexibility and better overall information about the availability and state of the drug antibody. Our experts can design a strategy to make type 1, type 2 and type 3 antibodies to your biotherapeutic target. Contact us for a discussion. Using our expertise in anti-drug antibody generation we have developed a range of antibodies targeted against marketed biotherapeutic drugs to support clinical patient monitoring and biosimilar development. Our ready-made anti-biotherapeutic antibodies are supported with data for PK, ADA and inhibition assays. They are available in monovalent Fab and full immunoglobulin formats and enable the development of assays with sensitivity in the low ng/ml range in 10% human serum, using a standard ELISA bridging format. More information about anti-biotherapeutic antibodies for preclinical research, clinical development and patient monitoring.